Andrew Chapman and Ryan Turner‘s False East is a comedy based on Sam Shepard‘s True West, that relocates the story to southern Ontario. You can see it playing at St. Vladimir’s Institute as part of the 2018 Toronto Fringe Festival, and it is a goofy hell of a show. 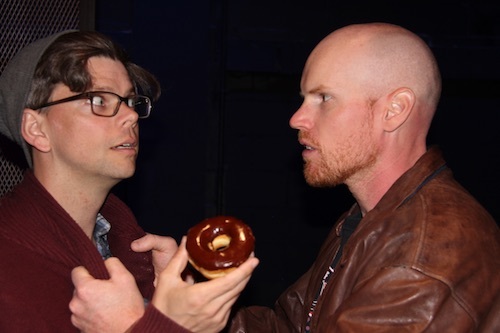 In this comedy, brothers John (Turner) and Gary (Chapman) battle over status in their jobs at “Sam’s café” by fighting over authorship of its menu. While Gary spent the past few years working hard to win the approval of his managers, John was living wild and free out in the dangerous, rugged expanse of… the Niagara Escarpment. With John now back in Toronto, Gary’s rise to power in the cafe is disrupted by John’s plans to overhaul the menu with a ridiculously impossible shepherds pie recipe. As their conflict deepens, their personalities turn out to not be as polar as they first appear. Or are they? My knowledge of Shepard‘s play amounts only to a broad synopsis, but even I can see the numerous parallels and winks in False East. A few examples: True West‘s screenplay is False East‘s menu; True West‘s desert is False East‘s… Niagara Escarpment; Many scenes directly mirror specific scenes in True West. If you are even vaguely familiar with True West, you will recognize its references in this play. However, this parody isn’t so vital that an audience member needs to see it to follow or enjoy the play. Much of the material is localized to Toronto and Ontario. Good news, this is very much a comedy play. Chapman comes from a stand-up comedy background, and I imagine much of the writing of False East was developed as a comedy. It prioritizes the laughs (I think) above all else, and at the preview I attended, the audience was in fact roaring. The whole cast is quite strong in terms of their physicality and the characters are well defined, and play off each other to good effect. The story is mind-boggling, spiraling into a ridiculous chaos that underscores the rhythm of the back-and-forth dialogue. The play worked for me when the humour emerged naturally from the characters, which it often did. Though there were also frequent moments when it seemed to prioritize making gags over keeping dialogue consistent with the characters. Some of these jokes still had me doubled over, but over time I felt more and more distanced from the play because of them. I prefer comedy where the jokes fit intuitively with the characters’ behaviour, and where they are not only the end-goal of the story, but also significantly drive it. While I don’t think False East sets out to do this with its humour, it is still very good at what it does aim for – setting up and delivering hilarious jokes. You would enjoy False East if you are a fan of live comedy, especially that similar to Second City. It is also definitely a show to bring friends to.